Sure, doing a double twist pike to lunge push up from a reverse headstand position is great, but sometimes you’ve gotta take things back to basics. Yep, in my humble opinion there’s a lot to be said for the simpler things in life. 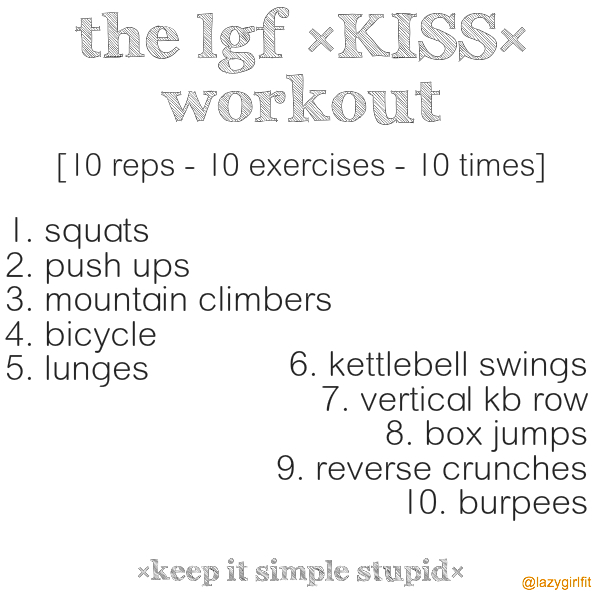 I’ve kept that at the front of my mind while designing this little workout for you tonight. All you’ll need is yourself, a kettlebell and a sturdy step or box. And you know what? If you don’t have those things then just switch in a different exercise – it’s that simple. You are welcome to do any variation of each exercise that you choose. Weighted squats, squat jumps, pulsing squats, frog jumps, front squats, squat press, caterpillar squats (ok that last one isn’t really a thing). The most important thing is to keep it SIMPLE. And fun. Fun is also good.